2 x 10" Triple Bandpass Sub. Quest Engineering subwoofers have a great reputation for their reliability and extended low frequency response. They provide massive output yet are extremely musical, due in large part to rigid enclosures and advanced transducer designs. The M series models use powerful, custom manufactured drivers. 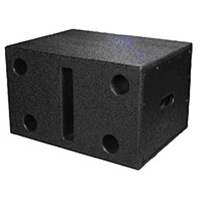 Integral pole available to support one mid-high or full range loudspeaker.